Stepper motors are a subject that keeps recurring. This little circuit changes a clock signal (from a square wave generator) into signals with a 90-degree phase difference, which are required to drive the stepper motor windings. The price we pay for the simplicity is that the frequency is reduced by a factor of four. This isn’t really a problem, since we just have to increase the input frequency to compensate. The timing diagram clearly shows that the counter outputs of the 4017 are combined using inverting OR gates to produce two square waves with a phase difference. This creates the correct sequence for powering the windings: the first winding is negative and the second positive, both windings are negative, the first winding is positive and the second negative, and finally both windings are positive. Internally, the 4017 has a divide-by-10 counter followed by a decoder. Output ‘0’ is active (logic one) as long as the internal counter is at zero. At the next positive edge of the clock signal the counter increments to 1 and output ‘1’ becomes active. This continues until output ‘4’ becomes a logic one. This signal is connected to the reset input, which immediately resets the counter to the ‘zero’ state. If you were to use an oscilloscope to look at this output, you would have to set it up very precisely before you would be able to see this pulse; that’s how short it is. The output of an OR gate can only supply several mA, which is obviously much too little to drive a stepper motor directly. 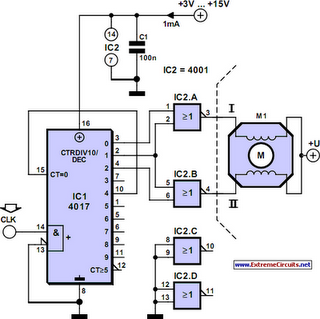 A suitable driver circuit, which goes between the generator and stepper motor.